Samson was a foolish, reckless man who paved the way to his downfall. His great accomplishment (deliverance for Israel) was also an act of revenge marked by a body count exceeding that to his life before then. He was quite different from the author of Psalm 119, who was pious. Eutychus was also foolish, for he fell asleep in a third-story window. He suffered fatal injuries, but St. Paul the Apostle raised the young man from the dead. New life is a theme in John 6:37-40, in which Jesus speaks of eternal and everlasting life. In the Gospel of John eternal life is knowing God via Christ (17:3). Everlasting life is simply the afterlife. In Johannine theology there is no eternal life apart from God in Christ. So may nobody commit the theological error of speaking or writing of eternity apart from God. New life can be physical or spiritual, but it is also a gift from God. May we use it for the glory of God. come before him with joyful song. we are his people, the flock he shepherds. his faithfulness lasts through every generation. God is the shepherd in Psalm 100. God is the shepherd-divine warrior who will end the Babylonian Exile in Jeremiah 50:1-7 and Zechariah 9:14-10:2. David, a troublesome character, is the shepherd-king in 2 Samuel 5:1-12. Jesus is the Good Shepherd in Luke 15:1-7. St. Paul the Apostle is the shepherd warning of “fierce wolves” in Acts 20:17-38. Faithful church leaders are the shepherds worthy of obedience in Hebrews 13:17-25. The core of church doctrine, as in the question of the nature of Christ, developed over centuries, during which debates, arguments, and street brawls, and knife fights occurred in the name of sorting out proper theology. Much of what we Christians take for granted these days came about over five centuries, give or take a few years. Even the latest book in the New Testament did not exist until the end of the first century of the Common Era, and consensus regarding canonical status required more time to form. In that context obeying orthodox bishops made a great deal of sense, although the definition of orthodoxy shifted over time. Origen, for example, was orthodox in his day yet heterodox ex post facto. The parable from Luke 15:1-7 assumes a team of shepherds, so one shepherd could leave to seek a lost sheep without fear of losing more animals. That parable tells us that all people matter to Jesus. They should, therefore, matter to us also. One metaphor for kings in the Bible is shepherds. Some shepherds are good, but others are bad, unfortunately. Good kings do what is best for all the people, especially the vulnerable ones. God is the best shepherd, protecting the flock, seeking an unbroken and unforgotten covenant with it, and searching for the lost sheep. The flock can be bigger, and we can, by grace, function well as junior shepherds, subordinate to God, the senior shepherd. I notice the community theme inherent in the metaphor of the flock. We depend upon God, the ultimate shepherd, and upon the other shepherds in the team. We also depend upon and bear responsibilities toward each other, for we follow the lead of others–often the lead of fellow sheep. Sometimes this is for better, but often it is for worse. Sticking together and following the proper leader is essential for group survival and for individual survival. May we, by grace, recognize the voice of God, our ultimate shepherd, and follow it. that he redeemed them from the hand of the foe. Placing that Psalm in the lectionary for these two days seems ironic, especially when considering the other two pericopes. The titular character of the Book of Job suffered, but not because of any sin he committed. Compounding his plight was the fact that he had to endure alleged friends, who blamed him for his plight. They insisted that, since God does not punish the innocent, Job must have sinned, thus prompting his extreme suffering. They advised him to repent of his sins, therefore. Actually, the text tells us, God permitted the suffering as a test of loyalty. Job protested his innocence and lamented his fate. Anyone who speaks of the “patience of Job,” as if he had any, ought to pay better attention to the story. …I am ready not only to be bound but even to die in Jerusalem for the name of the Lord Jesus. 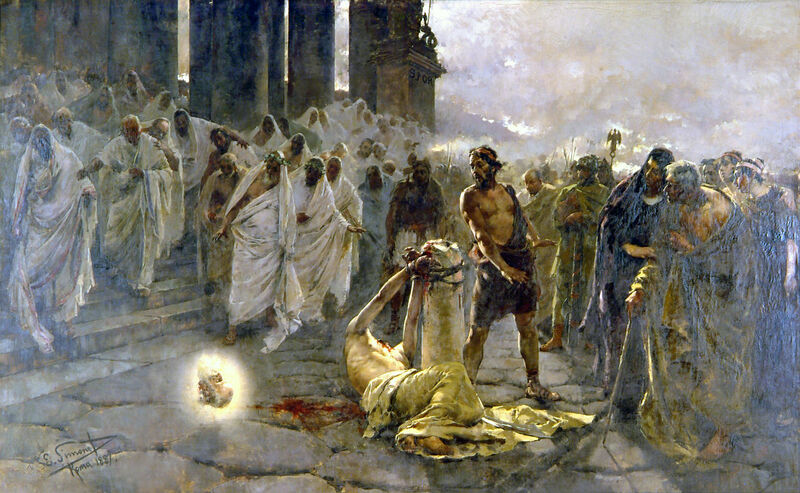 He went on to die for the name of the Lord Jesus Christ at Rome “off-camera,” so to speak, after the end of the Acts of the Apostles. The alleged friends of Job thought that suffering resulted necessarily from sins. Yet St. Paul the Apostle suffered for the sake for the sake of righteousness. Nevertheless, the assumption that we suffer solely or primarily because of our wrongdoing persists. Also commonplace is a related assumption which says that, if we live righteously, we will prosper and be safe and well. This is the heresy of Prosperity Theology. I say. I conclude that false ideas live on because too many people pay little or no attention to the evidence around them. Perhaps these individuals are merely incurious. (Many people are not very inquisitive, intellectually or otherwise.) Or maybe they are distracted among the other details of life. Regardless of the reason(s), they need to pay better attention and respond to the situation that is, not the situation they imagine exists. To claim that God never punishes the innocent or permits them to suffer is to make a pious comment–one which is false. What is the functional difference between permitting innocent people to suffer and punishing them? I recognize none. One is passive and the other is active, but the results are the same. The problem of suffering is complicated for we monotheists, for we lack the luxury of blaming an evil deity for misfortune while letting a good deity off the hook. Yes, how we live on this plane of reality affects the afterlife, but the rain still falls on the just and on the unjust in this life. Wicked people still prosper and righteous people still suffer on this side of Heaven. All of this can be difficult to reconcile with the idea of a loving and just God, hence bad theology in defense of God. I prefer an honest question to a false certainty, however.